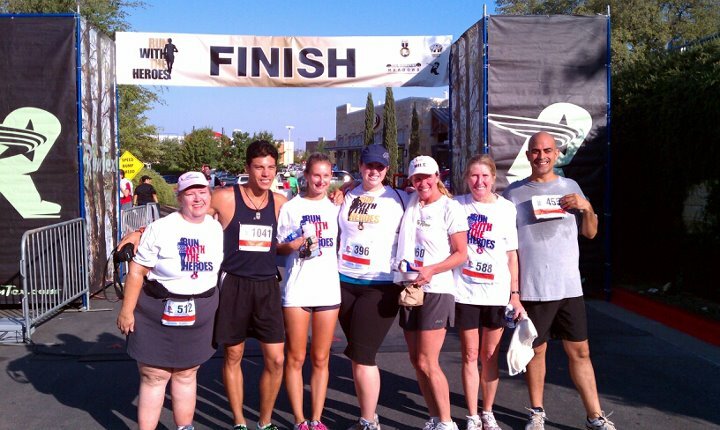 Vegan Dude's Blog: Run With the Heroes 5K - success! Run With the Heroes 5K - success! I ran my first 5K on Sunday! It was very exciting, even though I am very slowwwwwwww. It was great because there was a significant presence from my RunTex running group. Everyone gave it their all and deserves to be proud. Our awesome coach, boxer Alexis Camacho, placed third overall and first in his age group running it in just under 17 minutes! Wow!!! I set my first PR at 30:29 and plan on beating that at my next 5K. I went through a range of feelings in the race. It was exciting that morning before the race. 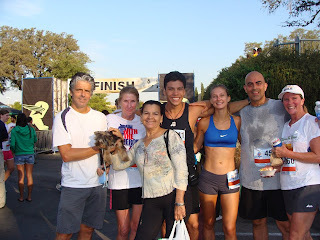 I was nervous, but I felt pretty confident that I could run the entire race. Alexis was the most excited. He was smiling uncontrollably and actually bouncing around!!! He suggested that some of us go to the front to the starting line. I didn't expect people to let us up there, but no one objected. We listened to remembrances of 9/11, as well as to a moving piece by a Special Olympics race participant, and talks by the APD Chief Art Acevedo and Austin Mayor Lee Leffingwell. Then, we lined up and were off. Immediately after we started running, a lot of the runners behind me started to pass me. My ego started to kick in, but I kept going in spite of it. I reminded myself that I was there not to beat anyone but to challenge myself. It was hard to fight against some of the feelings, especially when I'd see a 10 year old pass me, but I tried to focus solely on finishing. Alexis was too far ahead for me to see, but every once in a while I'd see Wilson from my group at one of the loop-arounds. She was also very far ahead of me, but it was helpful somehow seeing her. Marcy, also from the group, was behind me initially. She was beside me later at a time when I was really feeling particularly challenged and was losing steam. I think she just asked, "How are you doing?" before passing me. Somehow that got me to refocus and continue. Not long after, I saw Alexis on the side telling me that I was getting close. This made me push harder, and I ended up passing about 7 or 8 people before getting to the finish line. Jessica was waiting for me, cheering me on, as were those on my team who had finished before me. I have to say that finishing was a damn good feeling, and I can't wait to give it another go. As far as I can remember, this is my first race ever, with the exception of perhaps some little races during a very short track stint in elementary school or informal races in PE or against peers or siblings. I wasn't very athletic, but I do remember making it to a single track meet. Unfortunately, that's all I remember. I can't remember if I ran or just sat in the bleachers. 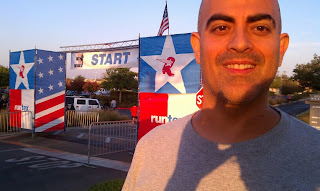 For sure, I had never run in a 5K before September 11, 2011. I'm excited to start this new chapter in my life.